A breakout is still expected to come very soon. Summary: The triangle is still completing, taking its time and testing our patience. I am still confident that when it is done the breakout will be downwards to move at least slightly below 1,072. The target for this final push up to end the triangle is again calculated at 1,099, but as soon as price reaches above 1,094.98 the breakout may arrive. Thereafter, the breakout downwards may be surprisingly swift and short lived. A new low below 1,081.10 would confirm price is breaking out downwards, especially if it comes on a day with higher volume. In the first instance, now a new low below 1,087.42 may provide earlier confirmation of a breakout. To see weekly charts and analysis click here. Cycle wave a is an incomplete impulse. Within primary wave 5, the daily chart focuses on the middle of intermediate wave (3). Within intermediate wave (3), minor wave 3 now shows a slight increase in momentum beyond that seen for the end of minor wave 1 at the left of the chart. Third waves for Gold usually have clearly stronger momentum than its first waves, so I still expect to see a further increase in downwards momentum. The strongest downwards momentum may appear in a fifth wave somewhere within minor wave 3, maybe the fifth wave to end minuette wave (iii) or minute wave iii, or that to end minor wave 3 itself. 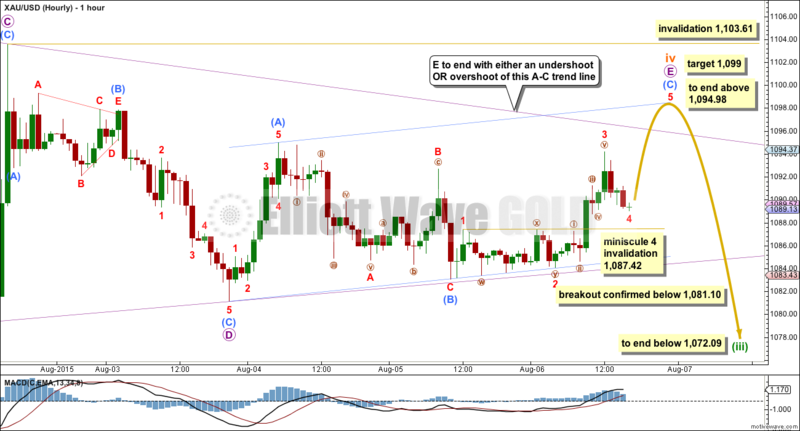 Subminuette wave iii looks like it is over at the daily chart level. Subminuette wave iii has a typical curved look to it at the daily chart level and this wave count has the right look. Subminuette wave iv may not move into subminuette wave i price territory above 1,157.14. Subminuette wave iv is a regular contracting triangle. The structure is clear on the daily and hourly charts. Subminuette wave ii was a relatively deep 0.58 zigzag lasting two days, and subminuette wave iv exhibits perfect alternation as a shallow 0.29 triangle lasting thirteen days. Zigzags are normally quicker than triangles, so some disproportion would be expected; the disproportion is just acceptable. I am removing the channel about minuette wave (iii) in favour of the bright aqua blue trend line, because this line shows nicely where price is finding resistance when it previously provided support. The triangle may now end when price touches that trend line which would see micro wave E fall short of the A-C triangle trend line, the most common look for the E wave of a contracting triangle. At this stage targets are approximate. When the triangle is complete it will be known at which point the fifth wave begins, then targets can be calculated more accurately for it to end. It is most likely to reach equality in length with subminuette wave i about 1,071. If price reaches the first target and the structure is incomplete, or if price just keeps falling through it, then a second target may be at 1,035 – 1,038; at 1,035 minuette wave (iii) would reach 4.236 the length of minuette wave (i) and at 1,038 subminuette wave v would reach 0.618 the length of subminuette wave iii. Extend the triangle trend lines outwards. The point in time at which they cross may see a trend change. Sometimes this is when the fifth wave to follow ends. Sometimes it is a trend change within the fifth wave. Once price is below 1,072, look for the structure of subminuette wave v to be a completed five wave impulse on the hourly chart. Once that is clear, a subsequent breach of the bright aqua blue trend line would provide some confirmation that minuette wave (iii) would be over and minuette wave (iv) would have begun. Minuette wave (iv) may be very shallow because minuette wave (ii) was relatively deep at 0.52. Minuette wave (ii) lasted three days and was an expanded flat. Minuette wave (iv) may exhibit alternation as another triangle or a zigzag most likely, and may last about five to eight days. If it is a zigzag, then it may be quicker and sharp. At 957 primary wave 5 would reach equality in length with primary wave 1. The final wave of micro wave E still looks incomplete. This triangle really is taking its time, but then that is what they do. Triangles normally adhere very well to their trend lines; sometimes they have small overshoots, but generally they do not have breaches of their trend lines. Because of this tendency, I expect submicro wave (B) is over since it found support at the B-D trend line. Submicro wave (C) is very likely to end at least slightly above the end of submicro wave (A) at 1,094.98 to avoid a truncation. As soon as price reaches above this point, look out for a quick end to this sideways triangle. Micro wave E is subdividing as a zigzag. Within micro wave E, submicro wave (B) may not move beyond the start of submicro wave (A) below 1,081.10. A new low below this point may not be a continuation of micro wave E, so at that point downwards movement would very likely be the downwards breakout we are waiting for. At that stage, the lower B-D trend line of the triangle would also be breached. Submicro wave (C) must be a five wave structure, and is unfolding as an impulse. Within submicro wave (C), minuscule wave 4 may not move into minuscule wave 1 price territory below 1,087.42. If minuscule wave 4 is over now, then at 1,099 minuscule wave 5 would reach equality in length with minuscule wave 1, and submicro wave (C) would reach equality in length with submicro wave (A). This target would see the A-C trend line of the triangle overshot. The final E wave of contracting triangles end with either an undershoot or overshoot of the A-C trend line. An undershoot is more common, but in this instance at this stage the target expect an overshoot. Because a new low below 1,087.42 could not be a fourth wave correction within submicro wave (C), this price point may be used as the very first confirmation point of a breakout. A new low below 1,087.42 could not be part of submicro wave (C), so at that stage submicro wave (C) would be very likely to be over. At this late stage with this consolidation very mature, that would also mean the probability of the whole correction for subminuette wave iv is also over. The downwards breakout should be swift, very strong, and possibly also very short lived. Subminuette wave v is very likely to make at least a slight new low below the end of subminuette wave iii at 1,072.09 to avoid a truncation. As soon as price reaches below that point, if the structure is a clear five wave impulse, then it could be over. Fifth waves following fourth wave triangles for Gold are sometimes surprisingly short in both price and time. Micro wave E may not move beyond the end of micro wave C above 1,103.61. If upwards movement were to invalidate the triangle, then subminuette wave iv may be morphing into a combination. They too are sideways movements, so substantial upwards movement would not be expected. At this late stage, because the triangle looks right, I expect price will not move above 1,103.61. The small pennant pattern continues to unfold. Pennants are smaller versions of triangles. This classic technical analysis pattern is the most reliable continuation pattern, particularly when it turns up in a clearly defined trend and unfolds on declining volume as this one does. During the unfolding of this pennant pattern, it is a downwards day which clearly has the strongest volume providing further indication that the breakout of this pattern is likely to be downwards. When price breaks below the lower trend line of the pennant, and when volume shows an increase, then a downwards breakout should be expected to be underway. Pennants can last up to three weeks. This one is within its second week. If the pennant ends tomorrow, then it will still be a pennant pattern. To become a classic technical analysis triangle it would need to continue into next week. ADX continues to rise during the formation of this consolidation. Despite price drifting sideways the trend continues to strengthen and remains down. A trend following strategy should be used. Trading with the trend is advised. A mean reverting system which allows trades against the trend should only be used by the most experienced professional traders, and for all others it is strongly advised to never trade against the trend. The simplest system for a downwards trend like this is to use resistance lines: each time price touches resistance that represents an opportunity to enter in the direction of the trend. Trades may be held until price either reaches support, a target, or if the trade is held for one day if you are a day trader. Depending upon your trading style, your risk management, and management of the equity in your account, stops as always are essential: they may be money management stops, they may be just above lines of resistance (allow for small overshoots), or they may be Elliott wave invalidation points. Corrections against the trend offer an opportunity to join the trend at a good price. Corrections do not offer good trading opportunities when they are at low wave degrees; trying to trade the small waves within a correction exposes your account to the potential for big losses. This approach outlined here is just one trend following method of many. There is a little positive bullish divergence last week: the low for 23rd July did not move below the prior low of 17th July, but On Balance Volume did make a new low. OBV moved lower while price did not. 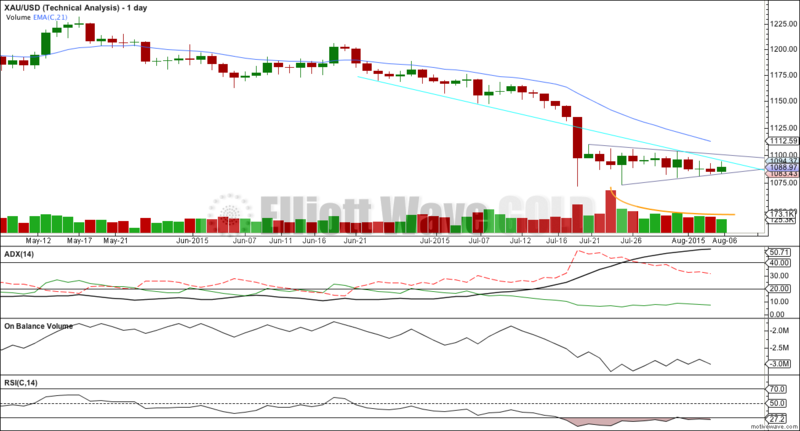 This bullish divergence indicates a correction against the trend to unfold, which is what has been happening. This correction should resolve this divergence. Today’s candlestick is very small and comes with even lower volume. Price is now squashed between the aqua blue trend line and the lower pennant trend line. The breakout is now very close indeed. The Elliott wave target at 1,099 would see the aqua blue line overshot. An overshoot is acceptable, if price returns quickly back below the line. It may be that if the aqua blue line is overshot price may find resistance at the upper pennant trend line. I am redrawing the trend line to match that on the daily Elliott wave count. That trend line previously showed where price found support, and now shows where price is finding resistance. It is reasonably shallow and repeatedly tested, so it is reasonably technically significant. While price remains below that line and ADX indicates a downwards trend, then that line may be used as an opportunity to join the trend each time price touches it. This analysis is published about 05:19 p.m. EST. I’m looking for an alternate. I have one which allows for subminuette wave iv to continue sideways as a combination: zigzag – X (triangle) – flat. It has problems in terms of subdivisions so that makes it a lower probability. And it would see subminuette wave iv continue for another three days (about) which would make it huge in comparison to subminuette wave ii. They are already highly disproportionate, for it to continue further that reduces the probability. In the short term that idea would also need downwards movement for the B wave within the flat. So when price gets down below 1,081.10 structure may tell us which wave count is correct. Some great analysis on this board. Really helping. I think micro wave E completed as a flat correction. Four of the five triangle sub waves must be zigzag or zigzag multiples. One can be a different kind of correction, so micro wave E as a flat does meet the rules. volume is slightly higher, but sill relatively low. I will be expecting downwards movement to be strong for Monday. Any hints today that would suggest which downward target has a greater probability? I’m still expecting the closer target which can now be calculated to be 1,068 to be more likely. We have all been surprised twice in recent months with how short fifth waves out of fourth wave triangles have been for Gold. I don’t want to be surprised again. As price nears 1,068 I’ll be looking carefully at structure, could it be complete? And momentum, does it fit for an impulse? By Tuesday we may have a more definitive answer as to which target is more likely, but for now I’ll say the higher one looks better. Lara Thanks for posting chart along with your comment. Excellent!!! and a great call on EW count. DUST and JDST look like they may be making inverted H&S patterns. Bullish for them. i can now see a completed 5 down on the dust chart! i think tham nailed it!!! A 5 by itself does not make a correction. A zigzag is 5-3-5 and a flat is 3-3-5. WoW!!! What happen? Just got back to computer and I see wave iv continue up. OK reread Lara’s hour chart. miniscule wave 4 ended at 1182 and now wave iv is trying to end here. Lara’s invalidation for this wave E is 1103. Gold should begin down from here. Lara wrote target 1099. I’m struggling with that 1103 invalidation as well. That means submin wave v is ready to begin here???? Triangle is still valid unless we go above 1103.61. While the triangle may still be technically valid, the character of the movement this morning is not normal for the end of a triangle before breakout. It might be more normal for a breakout of a triangle involving a false break and quick reversal, but in this case the directions are not right for the EW triangle we were all watching. What we have seen today looks more like an expanded flat on the 15 minute chart. If that is the case, then this upswing should be a 5, and I can see it in the 5-th wave of that 5 or else it is over. We’ll see. I do not know how an expanded flat would fit into what happened before. That is generally my thinking as well. It could fit as minuette or minute 4, under different data feeds where the big plunge ended higher at 1080 or above, not 1071. I have brought this up with the datafeed as well, but it is what it is. No point in discussing it. It is significant though, because a smaller fifth wave could have ended a couple days after the flash crash. Looking at movement from this perspective, gold may actually need even more sideways movement – I could make the argument for this only being the C wave, with D & E still to follow. Regardless though, some kind of a triangle formation is still playing itself out and the trend is down. Gold is clearly wrapped up in a 4th wave sideways movement, whatever the degree may be, and requires a 5th wave down. I am using any higher prices to add to short positions. 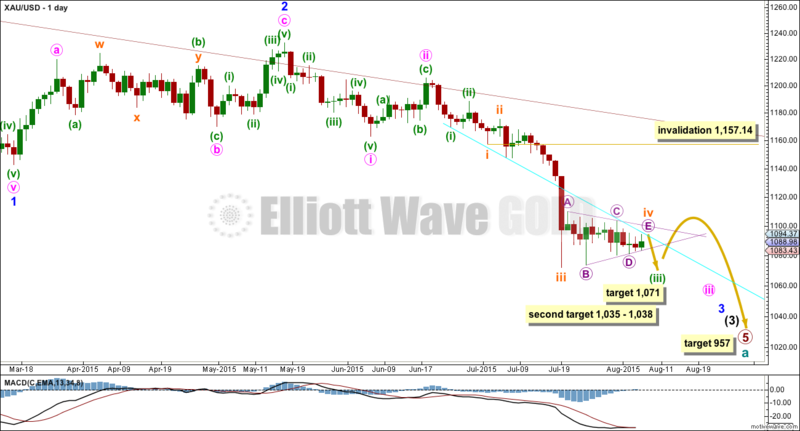 I have lowered my target for the coming fifth wave, because I now believe that gold is completing a larger fourth wave. My new target is minimum 1050. What does new high of 1098.94 do to our bearish case? I’m out of DUST. But could this be the end of subminuette 4 now? Most likely, yes. It just needs to stay below 1103.61. Lara’s hourly chart has not been invalidated AFAIK and we seem to be still in subminuette iv. The triangle gets invalidated around 1103 on Lara’s datafeed (lower on pmbull.com) and then we have to consider a complex combination pattern. Invalidation of the daily chart is up at 1157.14 so there is plenty of room for a rally if the market wishes to do that. Ok so 1097-98 appears to be holding Gold price down but really 1080-79 needs to be taken out which does not look like happening. Any one have any idea what to expect next? lol Thanks~! Anyone have a wave count here? Any change to the main count? The wavecount that would stay within Lara’s scenario is to have subminuette v be an ending diagonal. The ending diagonal idea would be invalidated if we go above this morning’s high. Good idea. Wave 1 down looks like a 3 and the deep retrace for wave 2 fits so far. Nope. We just made a new high! Playing by the rules still. lets see if we can get there today! Thanks Shahab – are you already in DUST? i like to scale in and out a lot! BUT WHAT JUST HAPPENED TO GOLD???? wow, gold is going wild! i am out, too wild for me! Wow – one morning at work and missed a lot of action. Correct to presume downwards move confirmed? Does anyone have a target DUST price based on current action? This is not too good is it – a drive through 1091-92 opens up 1097 and a drive through 1097 opens up 1105~! Very interesting the way Gold price is playing out…. I have a H 1096.90 / L 1086.80 with Gold price coasting around 50% retrace of this range; stabilizing here would likely threaten to take out $1097-98… Really need to see Gold price begin to coast under $1089 (preferably $1087) to open up $1085-82-81 and lower…Lets see. I did not see beforehand that miniscule 4 could morph into a WXY 3-wave affair. So my skill level has plenty of gaps. Neither did I expect that miniscule 5 would launch so rapidly. It spiked to the high of 1097.69 in just over one hour! I can’t tell whether this 1097.69 high was a third or a fifth within miniscule 5, not even at the 1-minute level. I do hope, for selfish reasons, that the current drop is a fourth wave and TAKES ITS TIME. If not, we may miss the DUST boat at the open, and the drop then is a lucrative $25. With NFP release as a strong stimulus, the odds are not bright at all, unless gold has much more to rise in its miniscule 5 wave. With scottrade I have the ability to trade in the after-hours. Pre-market trading is from 6am (eastern time) to market open. I think you use etrade? Do they have that option? Schwab too. Are you planning to buy before the NFP report? Yes I bought at the open today, and I was holding from yesterday. Unfortunately, Schwab pre-market only begins at 8am. Some chance may at least still get in below 37. E*Trade has pre-market option but we have to have a large capital with them. Morning Tham, Do you have a target for this bounce? is the first wave down over now? im not yet into a short position. do you have a target for the second wave correction for entering a short? Hi Robert & Raphael. Thanks for asking. My thinking is that the quick move down and bounce look like 1-2, 1-2. I am confident of the first 1-2 at 1097.69 – 1089.38 – 1093.50. But not so for the second until it proves itself. It goes 1093.50 – 1082.88 – ongoing. I will have more confidence if the current rise goes above 1088.24, the first subwave of the “ongoing” wave. If so, I will go for DUST as the third of a third will then be underway. Let’s see if this works out. The alternative is unpalatable. The third, micro 3, is now in the final stages, and the best we can do is to play the fifth wave. With the big rise up, I am waiting for it to drop back and then load up on DUST. Good luck. By the way, I have a DUST entry target at 33.29. I think I posted something like that yesterday. The possible rise is up to 45.54. Gold’s moves this morning so far have been crazy. Scrap the above. The second wave bounce is evident on the charts. Subminuette 5 so far is 1097.69 – 1082.88 – 1097.18. Tham, my apologies. I think I’ve lost the context of the waves. Not sure where we are. edit: oh wait. you’re saying we just experienced the a 2nd wave correction within submin 5, so Alister’s got it — we should go 3rd wave down within submin 5. In other words, it should be down from here for the 3rd wave? LARA, can you please confirm or deny the 1087.42 price point breach on your motive wave data feed? And if so, what type of structure (future price movement) are we looking at. Thank you very much. FWIW – netdania showing low at 1087.5. Looks like it could be too late to get back into DUST today at the lows. thats one that shows the triangle was not invalidated. Good to know. Both Investing.com and PMBull.com do not show a wave 4 overlap with wave 1 before the new high, so I suspect that will be the case with Lara’s data feed from FXCM. The triangle is likely complete now and we may move down fast when the payroll # is released. My data feed has the low of minuscule 4 at 1,087.61. So there is no overlap. The fifth wave looks like it is over now. Thanks Lara. old is moving lower from here. Just like your report outlined gold is following EW count. Lara, your update is much appreciated – thanks. chart posted above answers your questions. 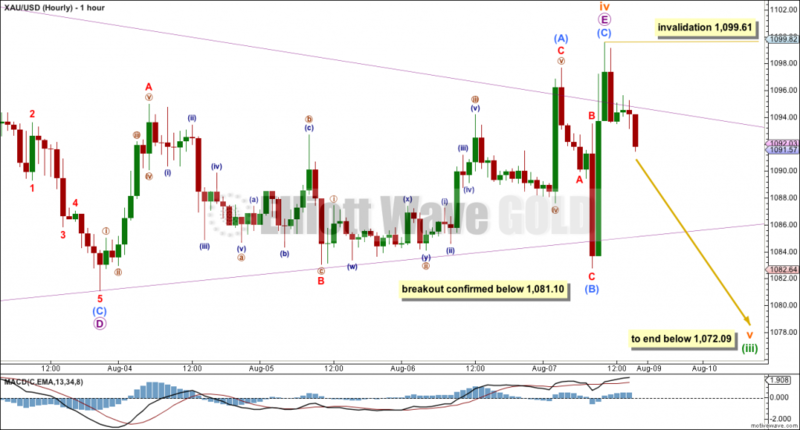 the fourth wave did remain above first wave price territory, that was a five up, but it only ended (A) within micro E.
Tham, does your analysis of DUST indicate if Gold minuette wave (iii) will conclude at 1070 or continue to 1035 ? A moderate projected move by DUST might indicate Gold stops at 1070 while a projected strong move by DUST might indicate Gold continuing to 1035 ? Hi Davey. I can’t tell yet at this stage. I don’t have adequate data feed for DUST (unlike gold — pmbull, very easy to use, no time delay) and the only reliable data I have is the daily candles from StockChart. I have tried various feeds that members have recommended (Google Finance, TOS, TradingView) but none of those are really satisfactory. They are either hard to read as I have to position the cursor precisely at a point on the chart in order to read, or differ largely (up to $1) from the live values. Moreover, some of them have a time delay of 20 minutes. So, even my analysis is at best a sufficient estimate of the smaller degree waves. I will have to take each step at a time. This set of data predicts a rise in DUST to 90-105 when gold price hits a bottom of 957, a number which I had reported in this forum and had been deemed by some members to be impossible. Back from trip to the animal doc. My beloved will be better soon. Funny when I read peoples questions about price movement is seems many (who agree with the 900’s or lower gold price) forget its not so much about “if” it will get there, but when. On that note,you have seen the charts I found then posted on the 8-5-15 page. Thanks for your comments below. I am excited it is non-elliott wave which seems to be confirming elliott counts. Hi dslrospering. Good to know that your dog is fine. All of us love our pets. They are like our own children, and we are very saddened when anything amiss befalls them. It is much more difficult with them because they don’t provide feedback if anything is wrong. We need to monitor them constantly for any sign of ill health. Tham, thanks for reply. Many things are impossible until they are proven possible–market will tell us eventually. I am watching silver–wondering if it can possibly go to five. If I read the chart you posted in 5 August forum correctly , downside target is 1030/1025 which is close to Lara’s secondary target of 1035 ? To me, the charts fit well. I do have a target of 1023-1028 for the next wave, namely the end of Minute 3. Alternatively, the target of 1035 give or take is in order if subminuette 4 was already over at 1109.99. I had toyed with this idea before, I think two days ago (and alerted members to it as an option). Now with price having dropped below 1088.93, this can become a very real possibility. It agrees with my wave count in this scenario. Yes, the charts concur w/ Lara’s targets. It a matter of when we might get there. Based on the cup charts (which are weekly) this week we are entering the last 42 days to hit a new low. That’s how I read it. It is Elliott Wave analysis that will help guide the path taken. Great analysis lately Lara. I was out of JDST yesterday with about a 7% gain, into JNUG yesterday and out today with about an 8% gain, and back into JDST today with an average around $14.45. I will be on my toes tomorrow, we may get a spike up to 1099, then big volume drop to 1071ish, and then a reversal. Ben, very astute trading / scalping! Ben you are an envy. But I will get there too. Thank you, and fantastic you managed to turn it into profit. It looks like the triangle may finally be over. Good luck everybody! It’s late now here and I must sleep. Will be up before NY closes to address any questions.